Are you tired of anger and frustration on the golf course? Do you wish you could play more consistently? Whether you want to (1) learn basic golf techniques, (2) improve your consistency, or (3) master the mental part of the game, this audiobook will teach you everything you need to know. Do missed putts drive you crazy? Stop doing the same thing while expecting different results. Start applying proven strategies to improve your game. I've waded through the plethora of contradictory opinions on golfing tactics and distilled them into straightforward instructions anybody can follow to start seeing steady improvement. Would you like to see your game steadily improve? Start learning ideas that work in harmony to lower your scores. As you discover each principle, apply it to your golfing, and take note of how your playing improves! Because you are a unique person, your perfect swing is going to be unique to you. I've boiled this complex action down to a few key ideas that will help you greatly improve your swing. What I share in this audiobook is designed to help your mind and body work in unison to find the swing that is optimal for you. Balance the technical versus the intuitive. All golfers fall somewhere along the lines between technical players and those who rely mainly on instinct. I have taken a mixed position, which allows me to share with you the best of both extremes, equipping you to play both technically and intuitively to your greatest advantage. Start winning and having fun on the golf course! Boost your game today: Buy it now! What made the experience of listening to Golf: Golf Strategies the most enjoyable? This book was a delightful listen because of the conversational tone and the details other golf books may not include. I liked the clear advice on buying clubs, and the fairly comprehensive information for all levels of players. Since this was a nonfiction offering, the only "character" is the voice of the author, which Joshua Mackey portrayed with life and energy. I liked how the author dispelled much of the confusion that can come from reading conflicting advice of multiple golf experts. He did a good job of blowing away the fluff and presenting the fundamentals that almost anyone can benefit from. The section on mental preparation was especially useful, not only for golf, which can depend so much on a player's focus and mental toughness, but for any sport. 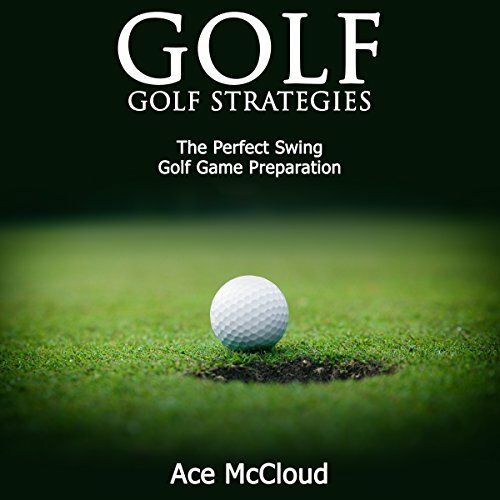 Gold Strategies by Ace McCloud is a great audiobook for those who are looking to try out golf or those who need to brush up on your skills. Ace McCloud explains in detail how to perfect your swing and be on your A game on the course. I felt that this book made it very welcoming and easy for anyone who is thinking about trying golf. It's a good alternative to getting someone to teach you! Where does Golf: Golf Strategies rank among all the audiobooks you’ve listened to so far? This book ranks in the upper 90% of all audiobooks I've listened to. It was informative and encouraging. What was one of the most memorable moments of Golf: Golf Strategies? I particularly enjoyed the golf strategies section of the book. You can have all the technical ability in the world, but if you do not go into a game with a strategy, you are at a great disadvantage. What does Joshua Mackey bring to the story that you wouldn’t experience if you just read the book? Mackey brings enthusiasm to the book. How to books are generally dry, but Mr. Mackey has a way of inflecting his voice to keep you interested. I might have missed some of the suggestions if I were just reading it. His voice kept me interested and listening. What insight do you think you’ll apply from Golf: Golf Strategies? I will definately remember all the golfing tips that will make the game more fun to play. I also enjoyed learning about the different equipment available and what would be the best for me. The book is very clear with its tips and exercises to make your game better. The history of golf imparted in the book was very entertaining and interesting. I also think the part of the book that explains how to be mentally prepared for the game has many great suggestions for any player from the novice to the expert. Since listening to this book I've seen dramatic changes in my gold game. The book lays out simple strategies that help you perfect your swing and be a champ on the course. The tips are easy to understand and take your training off the course as well. The book discusses ways to improve your game through proper nutrition, supplements and exercise. Overall, it's a great book for beginner and experienced golfers alike and adds some much needed insight into the game. Great book. Highly recommended. This is a good collection of golf strategies for players at any skill level. Here you will find tips for improving your swing, mental attitude, and physical skills. Learn how to build a good base of proper health and nutrition, strength, and good nutrition to get your best game. Anyone out to improve their golf game will benefit from the tips and strategies Ace includes here. The tips for success at the end will give you an edge as you choose the right equipment. I recommend this book. Prepare for golf for optimal performance! Golf is an extremely difficult sport, and there are so many aspects of the game that are necessary for achieving your greatest potential. This audio book will tell you how to achieve the perfect swing for any aspect of the game. It will also help you prepare physically and mentally for the game. Overall it is a great resource and I totally recommend it! It helped my golf game immensely. Got Game? Try out this golfing book first! This book has so many key points on making your golf game nearly perfect. You will be out playing like the pros do in the Masters by listening to this book so why not give it a try and make yourself look great in front of your friends out on the green? What did you love best about Golf: Golf Strategies? This book on golf strategies helped me improve my golf game drastically. It gave me a history about the game of golf that I was completely unaware of. I especially liked the section that talked about the differences in swing between the mechanical and feeling approaches. This book was a straightforward, so I really didn't have any extreme reactions. I would highly recommend this great listen to anyone that needs to know more about golf strategies. A must have book for any golfer, beginner or pro! Golf is definitely in the top ten. It is one of the most helpful and excellent books I have listened to, and I enjoyed every second of the book. He brings a command for your attention that not many other audiobook performers have. His voice is a force to be reckoned with! No, I did not. However, it did capture my attention and make me want to listen and take notes so I can become a better golfer! Ace McCloud has done it again. This is a book that Golfing beginners and even the pros can listen to and up their game. It is enjoyable, interesting, and exceedingly resourceful. Its a must have for anyone who loves a good golf game. For pros and novices alike! I am fairly new to golf but my dad is a practically a pro. I worked a few of the strategies in this audio book yesterday morning and my dad commented on how much I've improved since we played last month! He thought for sure that I had been practicing every weekend without him (which I haven't been able to hit the course since our last round). Thanks so much for this wonderful audiobook. I can't express enough how it's improved my game in such a short time. Off to the links! How to get your golf strategies swinging! Golf is a hugely practical guide to improving your game of golf and the subject is tackled with insight and thoughtfulness. Ace McCloud expands to a panoramic view of the different ascpects of thinking and behaviour that will affect how well you play, and he covers many topics that I wouldn't have immediately expected to find in a book like this, but which are clearly relevant. There is so much in there! From motivation to developing swing, fitness to supplementation, equipment to resisting over spending. I particularly enjoyed the section on overcoming problem situations (life in the bunker!) and dealing with pressure. Joshua's narrative is undulating and full of light and shade. He brings the words to life and makes this a very interesting listen. A must-have audio for anyone who would like to improve their game, and while it is golf-specific, I do think it has a lot to offer that could be applied to any physical activity that requires development. What did you like most about Golf: Golf Strategies? Which character – as performed by Joshua Mackey – was your favourite? I found this book very enjoyable to listen to as it broke down so many aspects to the game in a very engaging and informative way. I feel this book has given me a tremendous foundation on which to build on my game. The sections on perfecting your swing and practicing tips were very informative for me and I'm excited to put them into use! What other book might you compare Golf: Golf Strategies to, and why? I would compare it most to one of Ace McClouds other book "Top 100 Best Ways To Lose Weight Quickly and Healthily" because of the way it takes so many different aspects into account and explains and suggests how to make changes in a very effective fashion. There were no characters in this book, but as for the narrator, I found him to be excellent. He did a great job of being engaging and placing emphasis where it needed to be placed. Highly recommended for anyone who is interested in picking up some useful tips on there game or just starting out. There are so many aspects of the game covered here there is something for everyone in this book. I've often thought of golf as a boring game, but after playing crazy golf with friends I decided to try traditional golf. I bought this book to find out a little more about it and see if I could learn some swing techniques. I enjoyed learning about the history of golf, it made it more real to me. As someone who didn't know much about golf, I found the advice easy to understand and follow, and I think more advanced players would also find this book helpful because it really is packed full of helpful tips and information. From mental strategies to improve your confidence, to nutrition and exercise tips to improve your fitness, this book is a complete guide to the perfect swing. This audiobook has a very limited appeal. It is pitched at the level of someone who has played golf before, but really does not have a clue what they are doing - so maybe somebody who has watched a bit of golf on TV and attempted to play a couple of times. In terms of the 'perfect swing' mentioned in the title, there is very little relating to that in the book. It actually advises the listener to go on YouTube and watch a video of Tiger Woods's swing - I am not kidding. Not a more attainable/sensible swing like Adam Scott, Justin Rose or Francesco Molinari. I am not convinced that the author even knows much about golf, as it states the obvious throughout. Anyone who has played golf more than a handful of times is going to find this patronising. It is certainly pitched below the level of my 5 year old son. This audio book has proved to be helpful and full of great gold strategies to improve your game. It can help you achieve high levels of concentration through the right posture and at the same time develop your own strategy in life the same way the golfers do in their game. Overall, it will improve your life not only mentally but physically as well since it can motivate you to be more careful of your diet as well after realizing the importance of it. Improve Your Golf Game in No Time! I got this book for my dad who is a big golfer but has always struggled to get to the next level. This book was full of practical tips to help you improve your game quickly and easily. His favourite part was the section on mental and physical preparation as you often don't think of golf as something that requires training off the course. Dad couldn't be happier with the book and said he learnt a lot. Now he can't stop telling his friends about it! I wish I had listened or read this when I first started playing golf, brilliant. I have very little knowledge of golf, but I keep getting invited to play with my friends who are really into it and so I bought this book to give me a background in to the game and also some tips on how to do well in the game. It was full of very helpful tips about stances and exercises you can do to improve your game. It is also very instructive on the best equipment to buy to improve your game. As a total beginner I found this guide very useful and look forward to putting these tips into action. Full of useful nuggets for those who already have a basic understanding of the game. Liberating and will help me develop and improve all aspects of my physical and mental approaches. Strategies focus on how to maximise enjoyment of the game on and off the course.